The front entrance of Waverly Assisted Living on Oct. 27. Looks like Albany’s latest accommodation for the aged is getting ready to open. Waverly Assisted Living and Memory Care, at 2853 Salem Ave. S.E., is on one of my bike routes, and I’ve watched its construction for about a year and a half. 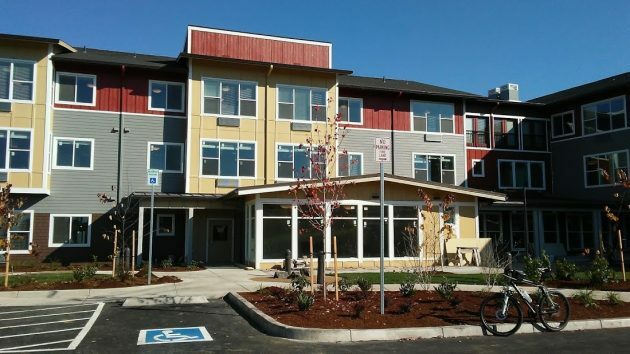 The three-story building run by Ridgeline Management Co. has 70 beds for assisted living and 21 for memory care, according to its website. The building permit issued in March 2016 says the place has 73,000 square feet and was valued, based on its size, at about $11.8 million. The first proposal fizzled. This is a different project on the same site. Might be interested in living there for both me and my spouse. Please keep us informed. My husband and I are contemplating our next step. Currently we have a small acreage in the country but the time is coming when we will need to move to a smaller place in town. Our plans are a 55+ manufactured home park. Reasons? Safety, security, services, age related people and activities, continued independence in our own home. But I have been told-correct me if I am wrong- that these parks have been outlawed as discriminatory to families. The existing ones are few and far between and grandfathered in. As such they are difficult to get into because the demand is so high that homes don’t stay on the market very long. So our hope is that when the time comes we are lucky enough to find the kind of home we want. Otherwise our choices are a family park with its noise and lack of services for our age, a home in town with those same problems plus lack of security and safety, or a warehouse such as the one in this article. Now that kind of warehouse may be somewhere in our future but not yet. So my question is why are these kind of discrimatory apartments allowed but not a like minded manufactured home park? The problem with these places is that the average middle class person is unable to afford them. The starting “rent” is usually about $3000.00 a month with any extra services such as personal care and medication administration added on. Long term health insurance is very expensive and most can not afford it…..it also does NOT pay towards the base rent in these facilities.